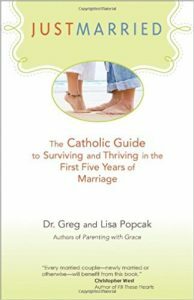 The authors caution recently married couples against believing that great marriages are “the result of good fortune or other accidents.” Actually, they insist, “couples in great marriages simply practice certain skills and habits” that other couples do not. “Too many couples think that being married means settling for less love, less passion, less joy, less intimacy. It doesn’t, and don’t listen to anyone who tells you otherwise,” the Popcaks tell newly married couples. Habits, attitudes and skills that strengthen marriage are central to the 13 chapters in “Just Married.” Money issues, relationships with in-laws, traits and tools to “help a marriage get off on the right foot from the beginning” are some of the book’s points of focus. Particularly helpful are its sections dealing with conflict. The authors attempt to steer couples away from the “popular belief that ‘if we were in a good relationship, it wouldn’t be so much hard work.’” That idea constitutes “a seductive lie,” they state. During the early years of a marriage, the Popcaks comment, “even a fair amount” of conflict – “certainly more than you want” – is normal. They view this as a time for learning to handle conflicts respectfully.